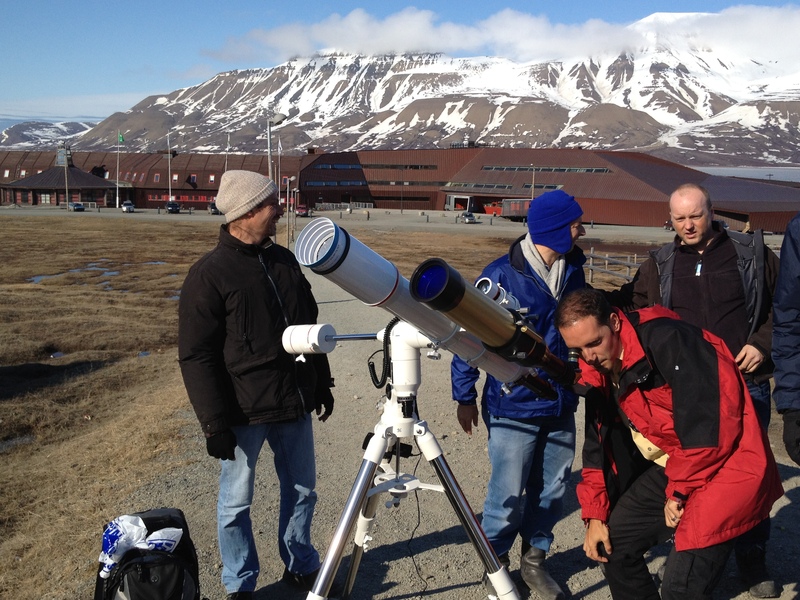 In Europe’s most northerly town of Longyearbyen, teams of scientists are preparing to observe the last transit of Venus of this century using ground-based telescopes. From ESA’s Space Astronomy Center (ESAC), Michel Breitfellner and Miguel Perez Ayucar – who are normally involved with the science planning of Venus Express – are preparing to observe the transit from the ground using solar and optical telescopes equipped with cameras. An identical set of instruments will be used to make observations from the other side of the world in Canberra, Australia. 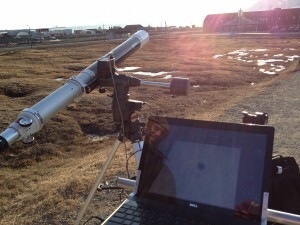 Live images will be broadcast via ESA’s Venus Transit Monitor. While most observers around the world are eager just to witness this historic and rare event, some astronomers will be using it to perform scientific observations. 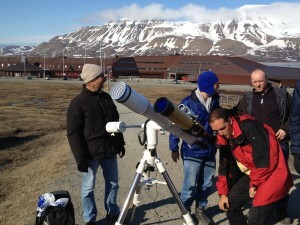 Thomas Widemann from the Observatoire de Paris and Paolo Tanga from the Observatoire de la Côte d’Azur and in association with Europlanet, are in Longyearbyen to observe the aureole of Venus – the thin arc of light that appears around the planet during first and last contact with the solar disc. The aureole is caused by light refracted through Venus’ atmosphere and is many times fainter than the visible surface of the Sun. By studying the brightness and thickness of the aureole scientists can determine the density and temperature of the atmosphere at different altitudes. The first observations of the aureole were reported by astronomers in 1761, but the June 2004 transit was the first time the phenomenon could be photographed. Since 2006 ESA’s Venus Express spacecraft has been in orbit around the planet, making detailed observations of the planet’s complex atmosphere. Widemann’s team will used specially designed coronagraphs to block out the light from the bright solar disc in order to see the aureole. Teams with identical telescopes are preparing to make the same measurements from sites located around the world and will be compared with data from other ground-based observatories as well as Venus Express. 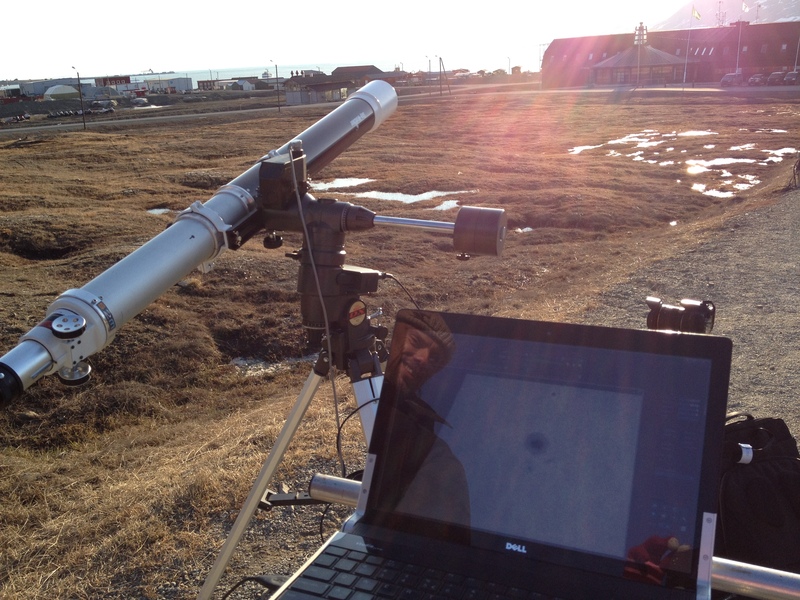 This entry was posted in Transit of Venus and tagged Aureole, Svalbard, Venus transit 2012. Bookmark the permalink.